This particular bike has been known to me for about 3 years now. It came Into my life when a good mate of mine Sean bought it, this was the guy who gave me the time of day and taught me the welding basics I needed to go on and continue learning myself. 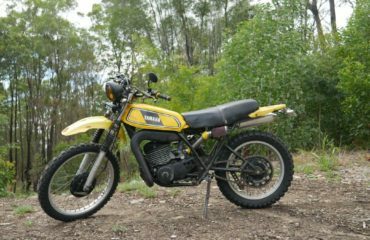 When Sean fell on some hard times shortly after we had started modifying it, I had another friend in the market for a project. Mitch was an old mate from High School who had been bitten by the bike bug early but had not ridden in a long time. He had seen the bikes coming out of my garage and decided he wanted in. 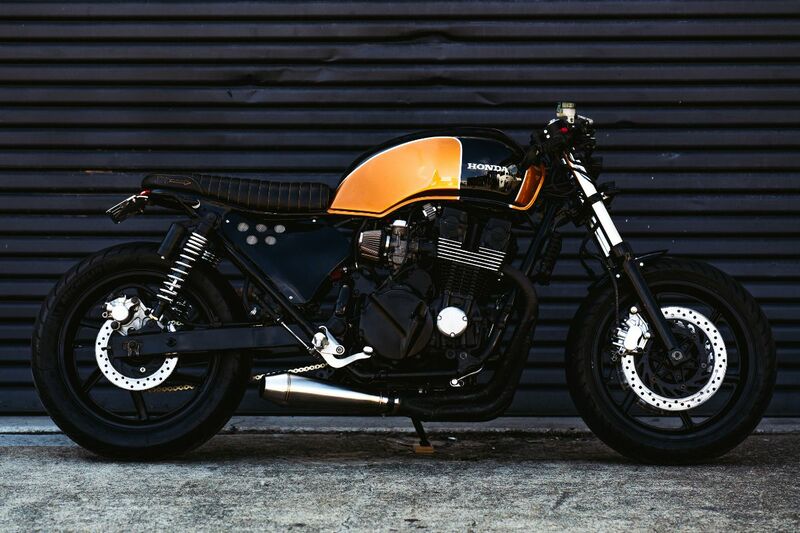 So the Batton on the CB750 project was passed on. The 1992 CB750 wasnt by any measure a masterpiece when it left the factory floor and many will ignore it as a prospective café racer build due to its oddly shaped tank and strange subframe. 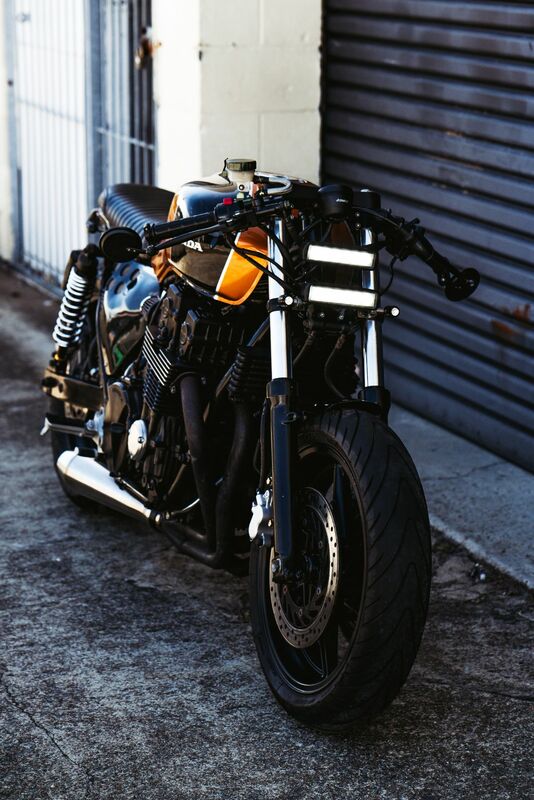 The bike had been previously modified but needed some work. From the get go I saw a short stumpy seat leading into the widening of the tank like a bulldog across the shoulders. 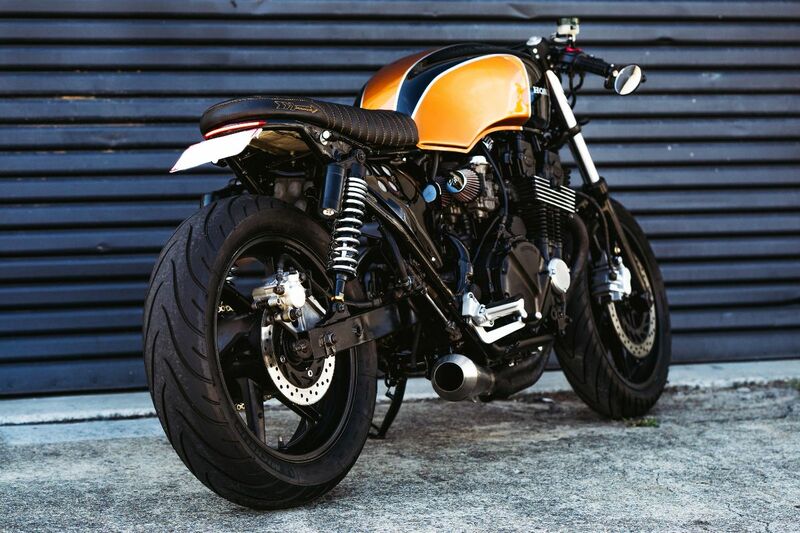 I wanted a simplistic look with a little throwback to the 70’s CB750 models that paved the way for this ugly ancestor. 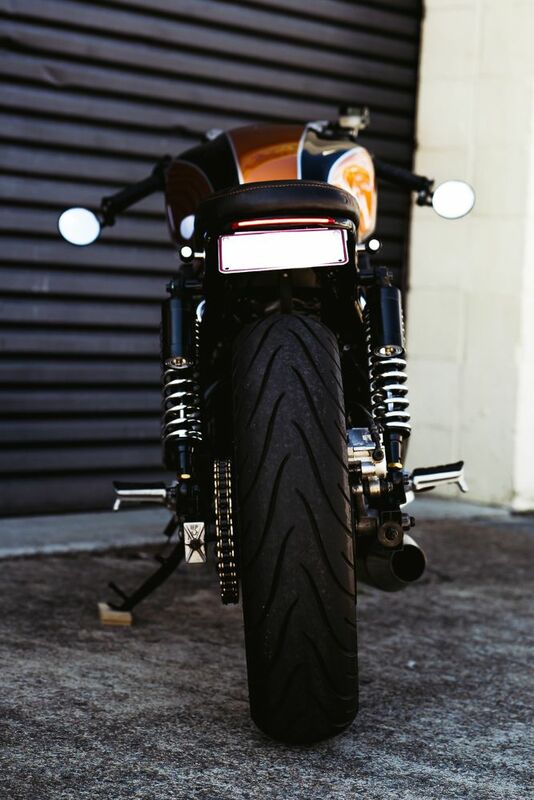 The bike itself wouldn’t suit a pure Café Racer style, so Mitch and I thought it out and came up with an idea that would cross over between a brat styled racer and a street fighter. 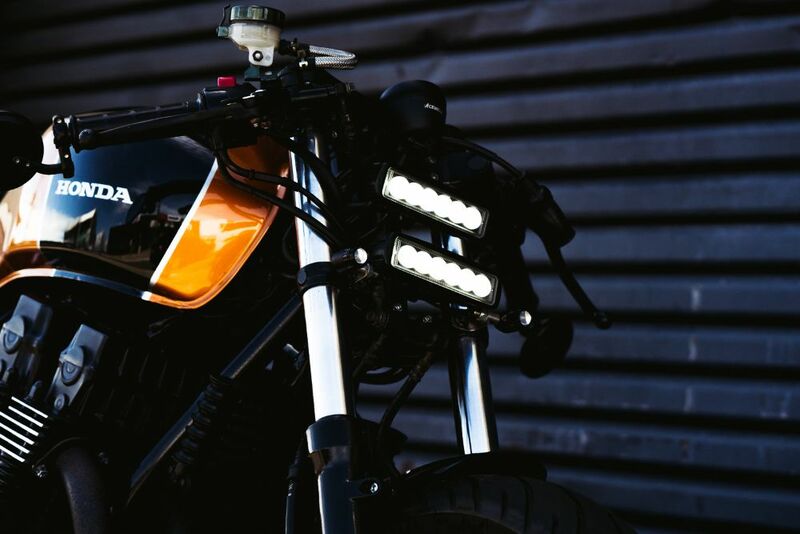 Fattened front end with a street fighter style lighting set up. The previously modified tail was stripped off and a tail hoop added, custom seat pan fibre glassed and foam hand shaped. 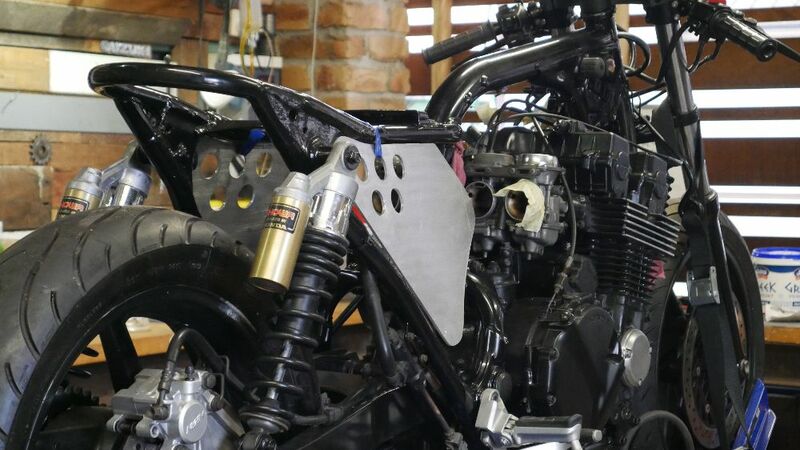 The airbox and electrics had already been ripped out and were a total mess, so the rest was stripped out and the bike was pulled down to a bare frame and built from there. After powder coat Mitch took on some of the assembly before bringing the bike in for a Custom Top triple clamp and for me to fabricate the headlight assembly. 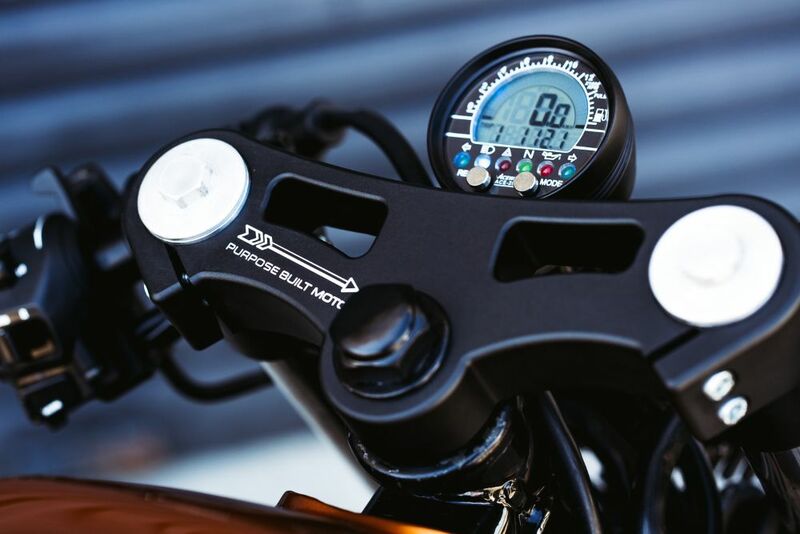 A custom triple clamp is a bit of an expense but well worth the result, I designed a sleek but chunky piece that completely transformed the front end of the Brat style/ street fighter CB750. The bike was re-wired with a new electrics tray/battery box and I hand beat some aluminium side covers for the Honda. The RC42 models have a single back bone frame which in my opinion doesn’t lend itself to an open side without covers. 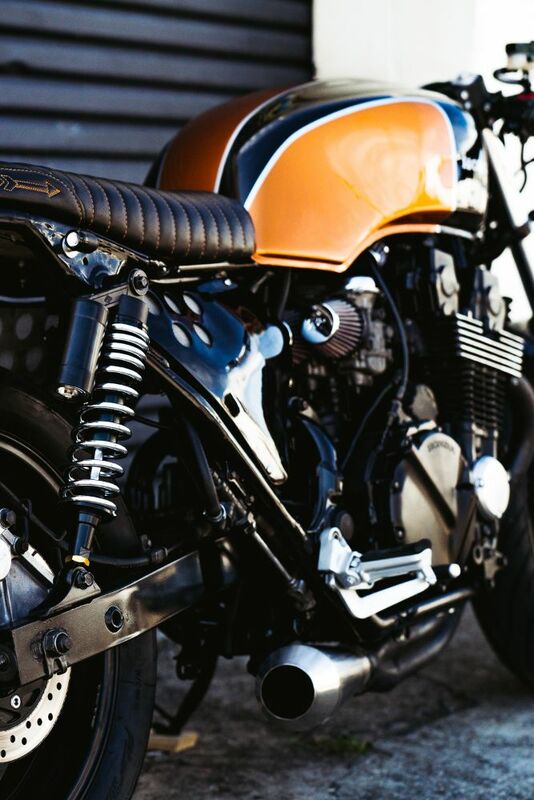 The bike was rolling and ready to run, we had our mate Jamie at Garage 37 put the CB750 on the dyno and get it running sweet with the new exhaust set up and Pod filters. Once tuned the brakes were rebuilt and new pads put on. 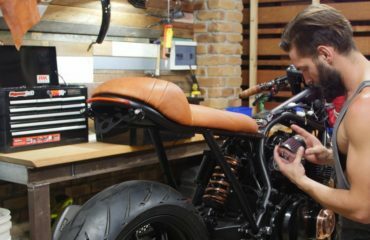 The tins were sent to the guys at The Panel shop Mermaid to be finished in a Honda burnt orange with black and silver detail. Looking back on the early model CB’s with an updated detail to suit the shape of the tank. 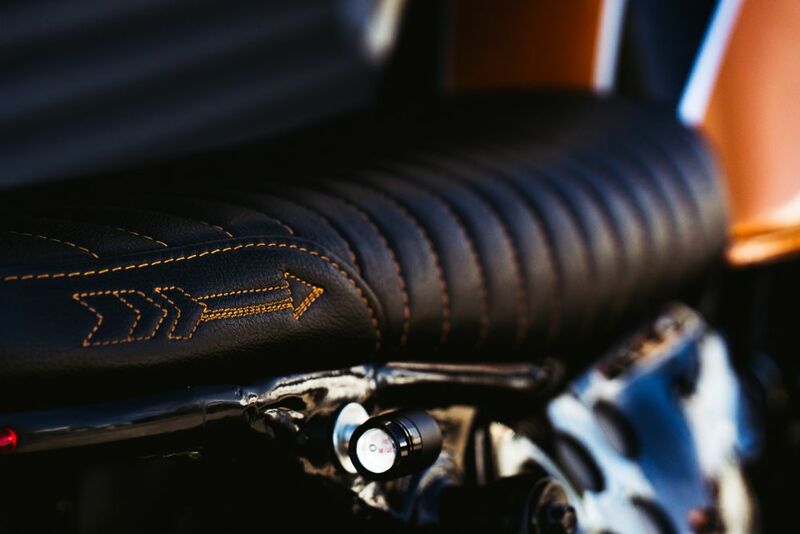 The seat was finished in a black leather and burnt orange stitching. Final Assembly was a lot of fun. 2 blokes who have known each other since they were kids, piecing a bike together that was one of their dreams for a good few years. 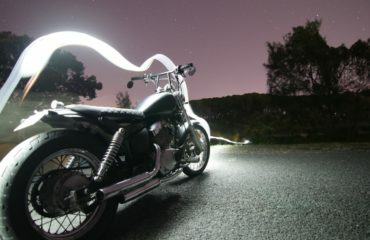 The end result had Mitch smiling all the way down to Iron and Resin Currumbin for the first ride on his newest toy.